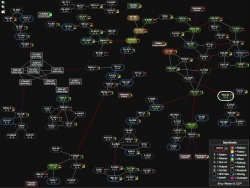 The goal of the EVE University NullSec Campus is to introduce new players to NullSec in an educational environment, giving students the experience of living in 0.0 space with all of the risks associated with it. We seek to do this by establishing and maintaining a supportive base within NPC NullSec space, allowing campus members to learn how to survive in this harsh environment through practical PVP and PVE activities. The great benefit of NullSec lifestyle is simplicity. It is this simplicity that makes the NSC a far easier PvP training ground than HiSec, LowSec or WH Space. Here at the NSC you do not need to worry about the many complex mechanics that can make PvP in other parts of the Eve Universe incredibly difficult. We fly Not Blue Shoot It (NBSI) which means that anyone and everyone is a target, provided they do not have a positive standing with Eve University, and because there are no gate guns, Concord or Standing losses within NullSec, we are freely able to engage wherever we please. This, coupled with the fact that Syndicate, the region of space that the NSC is based in, sees more low-value ships per fight than any other area of space, creates an amazing learning environment filled with opportunities. To feed the PvP addiction, NullSec offers fantastic and at times very lucrative PvE opportunities due to the inherent risks associated with it. NPC missions within Syndicate pay more than HiSec, higher difficulty exploration sites such as NullSeC Data and Relic, Sleeper Caches and the higher end DED sites can be found throughout the region, the stations throughout Syndicate have reduced tax rates for Industry and Planetary Interaction has higher yields. There is an Ice Belt in the NSC back pocket, NullSec Ores and even the belts have very lucrative ratting opportunities such as NPC haulers, Officer spawns and NPC Capital Ships. If you like the sound of all of that, then please keep reading. This page will provide a basic overview of what the NSC is about as well as links to more detailed pages so that you can see what is on offer at the NSC and how you can quickly settle in to the NullSec lifestyle and make the most of your time with us. Joining the NullSec Campus community is as simple as joining the ingame NSC.E-Uni chat channel. Here, you can ask any of the campus members questions about life in NullSec and how to get involved with the community. Similarly, join us on mumble and talk direct to our campus members. There are no official title requirements for joining the NSC, and you do not need to commit any specific amount of time to the campus. Just head over and enjoy the NullSec lifestyle as and when you feel like it. That said, we do ask that members have carried out the following actions prior to travelling to the NSC to make your life smoother, once there. Once you are here, consider dropping an introduction in the Hi/Bye forum thread. While we have no formal requirements or barriers to joining the campus it is mandatory that members join the NSC standing fleet and NSC mumble when they are at the NSC. If there's no fleet, JOIN MUMBLE, make one and put up an advert so others may join. For your own safety, members should also set their overview up according to University standards. A willingness to have fun and learn is always welcomed. The only thing that we, as a campus, expect from our members is they are respectful, polite, and friendly to our many Syndicate neighbors and as always, members must follow the EVE University Rules. Ingame chat channel NSC (EVE Uni), used for general Q&A. Ingame chat channel NSC Intel (EVE Uni), the intel channel that we share with other blue corps within Syndicate. Ingame mailing list UniNSC (current unistas can join freely, ex-unistas needs to ask the Campus Leadership for permission). The Mumble channel NullSec Campus under Special Projects & Events (need to be registered on the forum). NullSec Campus Slack (see this post for instructions on how to set it up). The NullSec Campus section on the forum. Join the standing fleet at all time as well, as a lot of communication happens in fleet chat. To the right of this page you will see a number of links which provide newcomers with all the necessarily information required to get up to speed. Don't worry, there is no need to read it all at once, however the pages below are important reading prior to, or upon arrival at, the NSC. How to get to the Campus has all the routes to the NSC including several fits and advice for avoid bubbles and gate camps. Campus Rules lists the additional rules that we have at the NSC to avoid local diplomatic concerns as well rules of engagement for PvP. What to Bring explains the common ship types that we fly at the NSC, why we fly them, and how they play their role in the fleet. Bookmarks details the importance of Bookmarks, how to make them, and how to use them to travel safely. The Rookie's Guide To Fleet Ops is an excellent guide to serve as a reference for new pilots to reduce common blunders and mistakes during Fleet Operations. Consolidated Information Thread A consolidated sticky containing single-topic posts about living in the NSC. Ship Replacement Program Lost a ship? Read about what qualifies for the Ship Replacement Program specific to Null-Sec Campus. If you are still reading then we hope we have your attention and we will shortly be seeing you at the Campus. All we ask is that people come down and experience NullSec for themselves. We understand that NullSec might not be for everyone, but we hope that the time you do spend with us will serve you well if you choose to move to another part of Eve University, having navigated, survived and thrived in some of the harshest systems that New Eden has to offer. A Map of Syndicate highlighting ship and pod kills within the last 24hrs. Fewer kills are shown in shades of green while higher amounts are shown in shades of red. Admin Officer (Lanik Solette, USTZ) – Upkeep of NSC background administration that keeps the Campus running; such as NSC Slack invitations, maintaining the UniNSC mailing list, and paying Campus bills.